How to Make New Wine Crates look Vintage and Old, The easy way. 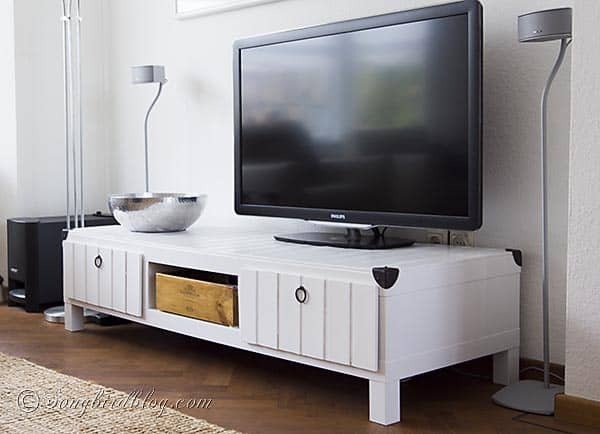 Goodday, as promised I am here today to show you how I made that vintage looking wine crate. It was quick, easy and you can do it too! I promise. She looks rather nice doesn’t she? I think she is the perfect little detail in my TV-table. And she is handy too. Our remotes and TV guide now have a proper home and don’t need to be hunted down anymore. I had envisioned putting one of my true vintage wine crates in there from the start. Except I had not actually measured anything. Turns out my old wine crates are too big (probably where used for Champagne bottles, I know I have expensive taste….) and didn’t fit in the slot. So I had to come up with a solution and decided to make a new wine crate (that I have lots of) look old. I happen to have an abundance of new wine crates. This time last year I sent out a cry to my friends. It is that time when the end of year business gifts are exchanged and over here that means that a lot of bottles of wine in wooden crates are being given and received. I let my friends now that I would be really happy if they cared to share that wine with me, but that I would understand that they’d prefer to drink that themselves, but they could still make me very happy if they would save the crates for me. Many of my friends came through for me and now I have a vaste selection of brand new wine crates. They are intended for a project I have yet to start, but in the mean time they serve me well as storage units all over the house. So I just had to choose the right one for this project. Next one find a wine label to use. 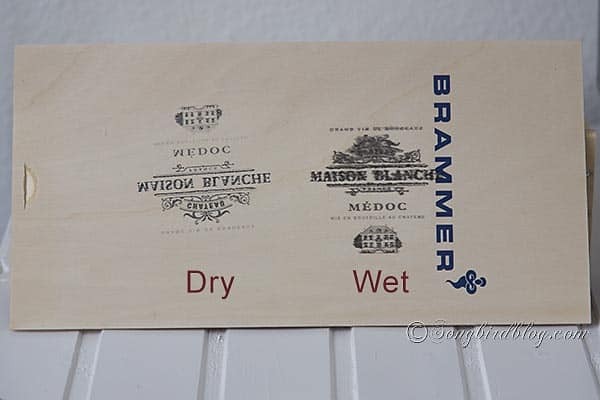 Google came to the rescue and I found this site where a wine dealer has collected a whole lot of actual wine labels and put them up in printable form. You can find the wine labels underneath that link. 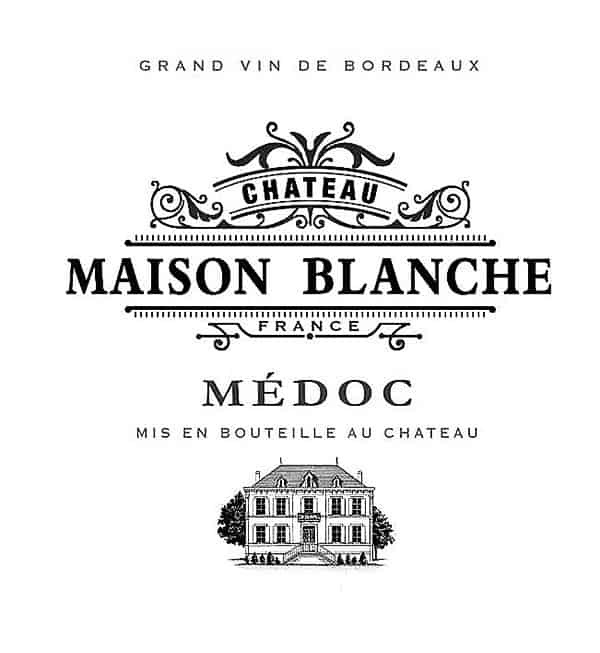 When I found a Maison Blanche label I knew I had found my perfect one. Next step transfer that label onto the crate. I have always dreaded this step. Usually it involves tracing the design in some way, or using solvents that I can not find over here. Then I stumbled unto the wax paper method from Angela at Unexpected Elegance. That seemed doable. Problem I have no idea what wax paper is, or if I could get that here. Then in the comments on her post she mentioned using the empty sheet that is the backing of a page of labels. I got that! I changed the label in Photoshop until I liked it and it fit the crate. Then I printed a test page with my inkjet printer and transferred it to a wooden lid, to try it out. Angela suggests two methods: a dry and a wet method. I tried the dry method first. Worked perfectly. Good thing this was a test run cause I had forgotten to flip the image. The second one I tried was the wet method. Darker but a lot more blurred. I preferred to use the dry method. It came out a bit more vague on the actual crate than on my test lid. The wood on the lid was smoother than on the side of the crate. But I was okay with that, if it had been too crisp I would have sanded it off a bit anyway. Three quick coats of a pine varnish made it look nice and old. This whole project cost me about an hour divided over several sessions. The crate was free, as was the label. I used up three sheets of label pages (the backing that is, if you have saved them after using your labels this would be free too). The pine varnish was leftover from another project. This project was, quick, easy and cheap. Gotta like ’em that way! If you like my label here is a printable for you. Just click the image and save it to your files. And that is how you make a new old wine crate. If you like to make some yourself, make sure you remind the wine receivers in your life to save you the crates. This is the perfect time of the year to be on the hunt for those crates. And as always have fun with it! ooh I love this idea…..fabulous. Marianne I just love your wine crate and your tutorial. I’ve tried the wax paper method with my Laser printer and it worked wonderfully too. Thanks for providing this wonderful graphic – I will definitely be using it on a future project. See I like your blog…great ideas…now I’m wondering if the sticker backing works better than wax paper!!! Oh. Wrap potatoes in wax paper without piercing!! And into fabric fluffy bag. See how quick supper can be with wax paper in your life??? There used to be only one brand. CutRite Wax Paper. Oh the bunch of nonsense I gather in my brain!!! And: Your wine crate looks really great! I like this easy way! The hard way is taking Minwax Special Welnut, and gently brushing it around the crate in a random pattern. If you have the time and inclination, this is a really nice way to “Vintage-ify” the crate as well.